A new restaurant interior design and branding effort took us into a different direction than the one we usually take. As a rule, we love colors and enjoy the visuals of bright tones and sharp contrasts. 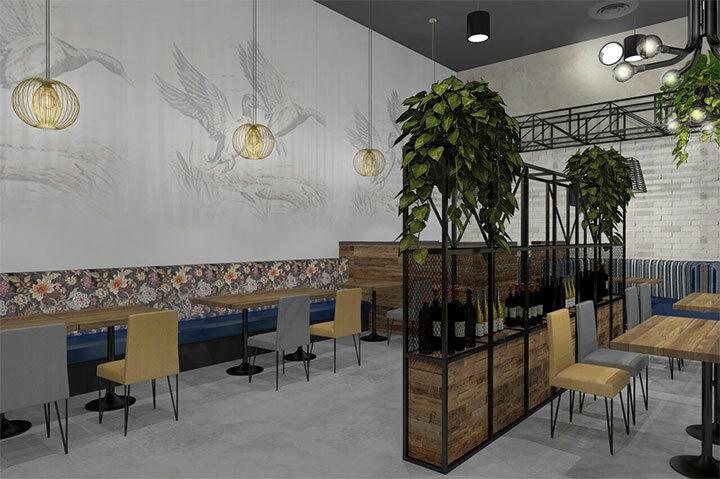 However, for the Two Blue Ducks restaurant in San Diego (located at 2835 University Drive), we chose a more muted chromatic palette that would fit the name and the spirit of the place. 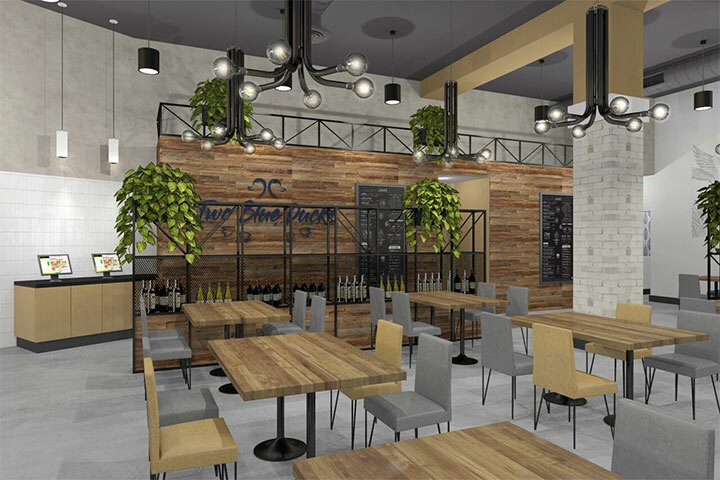 We knew we wanted to include some rustic elements into this restaurant interior design plans. The space was a good fit for a few industrial touches, to which we added modern elements to make the place look clean and fresh. The result is an interior where the structural quirks turn into elements of decor, and where the space is full of character despite its size and openness. We built the interior on a neutral background of mostly gray shades with a few occasional touches of brown. The wall treatments and materials change from one area to another, introducing variation in shades, textures and patterns. However, the exposed brick, the tile, wood, wallpaper and painted surfaces are centered around a consistent color palette that brings them together and makes them flow naturally from one another. Wall graphics pay tribute to the restaurant’s name using the same subtle colors, while the different ceiling elements are painted in black for a unified look. The wooden tables with their straight lines and rustic vibes mix with modern chairs that match their simple lines. Most seating areas play with the same color palette, bringing together brown tables and gray chairs. Because such an arrangement may run the risk of becoming monotonous when done on a large scale, we introduced a few light brown chairs here and there. This unexpected element breaks the visual uniformity, yet keeps the space orderly, cohesive and consistent. 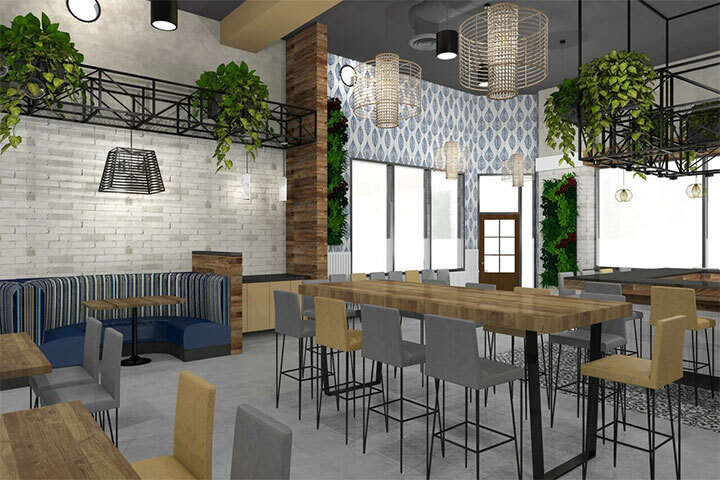 In all this expanse of neutral shades, we used blue – the true star of this restaurant interior – as an accent color. This made it stand out against the background shades, when brought in by the blue benches and booths along the wall, and the blue logo element. The circular upholstered booth benches also balanced the rest of the interior with softer lines and textures. Stripes and flower patterns in this area warm up its muted colors without taking over the place. We created different seating areas around counters, window counters, tables and counter-high tables, to accommodate different group sizes and customer preferences. These areas are sometimes defined but their simple placement within the floor layout, sometimes with design elements such as patterned floor tiles. 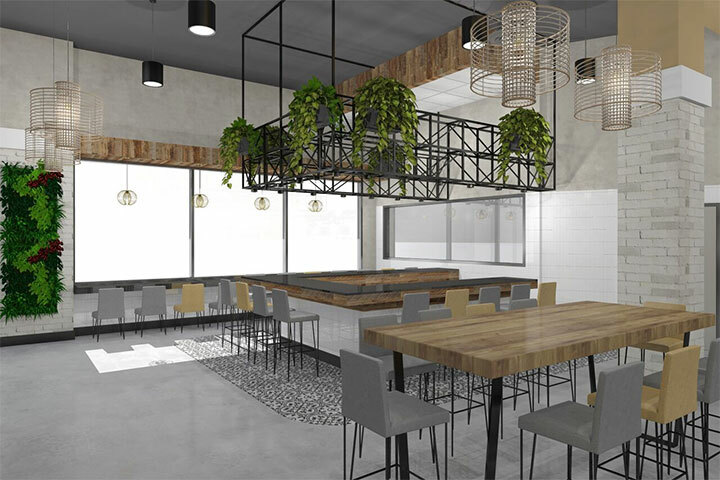 Adding metal elements to this restaurant interior design was a good way to balance the warm, natural look of wood and bring one more modern material into the mix. The black-finished metal of the chair frames and table legs finds a decorative counterpart in the wall and ceiling metal structures used as unique flower shelves that serve the function without the bulk. Wooden shelves enclosed in metal frames and rustic-looking chicken wire serve as appetizing wine displays. The light fixtures with cage-like lamp shades are another rustic element that we mixed with modern chandeliers, pendants and recessed lights for a healthy balance. Lush greenery completes the look with splashes of color all throughout the restaurant. 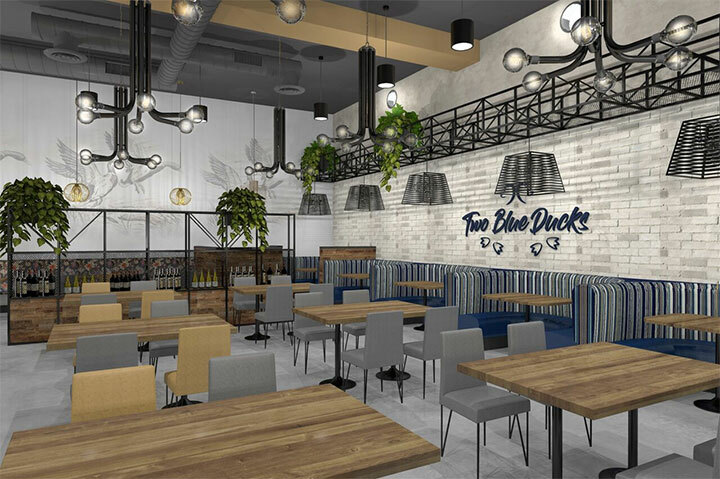 We also designed the logo of the Two Blue Ducks restaurant, where the same shade of blue, a playful font and a bit of sense of humor combine into a simple yet easy to remember concept. Together with the restaurant interior design, it creates the image of a space where customers know they will have fun.